The young Polish couple managing the apartments, Karoline and Martin, were very friendly and hardworking. The rooms were very clean, and there is a common laundry room with free washers and dryers. Also a common kitchen with everything you need. Rooms are simples and basic but clean and comfortables. Strategic position. Don't judge the book from his cover. Let's get in and enjoy. Chef made scrabled eggs for me during breakfast. I did not expect that at this price point. Good service and value for money. the room is clean and tidy, with basic furniture. staff are efficient. The place was clean. 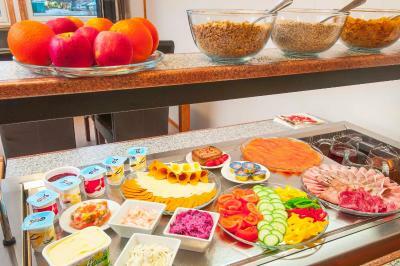 Due to a mistake very badly handle by the staff we were offered the breakfast which was abundant and of nice quality ! Sov veldig godt. Stilt og rolig. Utmerket service. Очень приветливый персонал, нашли куда спрятать мой велосипед, хорошая кухня, прачечная и чистые комнаты. Located by the Førde Fjord in the industry district of Førde, Efinor Jobbhotell Førde offers free parking and budget rooms with free Wi-Fi. Bringeland Airport is 8.7 mi away. 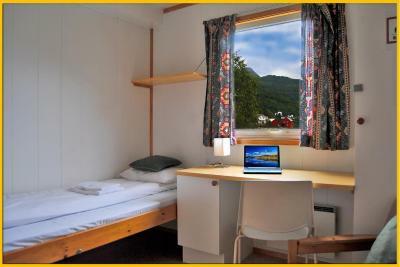 A work desk and a private bathroom with shower are featured in all rooms Efinor Jobbhotell Førde. 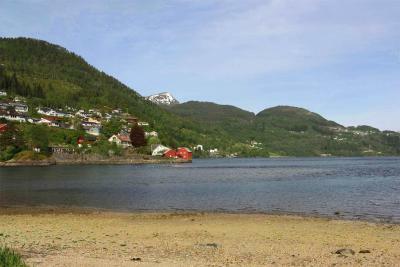 Some rooms include fjord views. 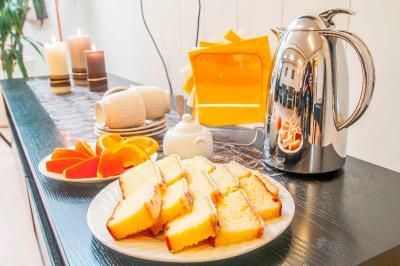 Guests can prepare their meals in the communal kitchen. Barbecue facilities are also provided by the waterfront. 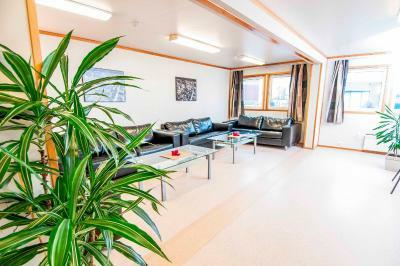 Leisure facilities at Efinor Jobbhotell Førde include a TV-room. 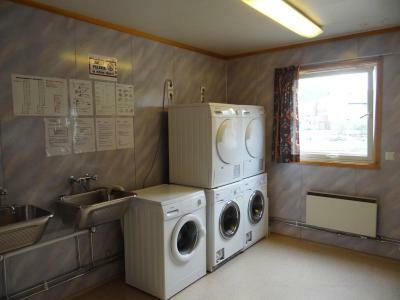 Guests enjoy free use of the on-site laundry room. 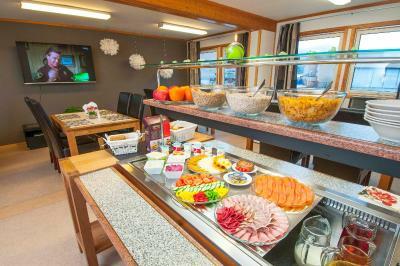 A supermarket is within a 5-minute walk of the hotel, while Førde Bus Station and a restaurant are 10 minutes' walk away. 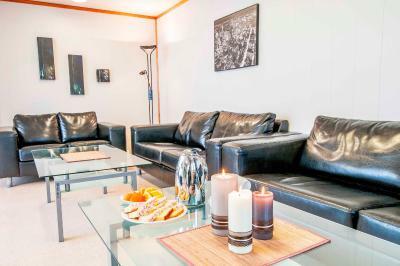 When would you like to stay at Efinor Jobbhotell Førde? House Rules Efinor Jobbhotell Førde takes special requests – add in the next step! Efinor Jobbhotell Førde accepts these cards and reserves the right to temporarily hold an amount prior to arrival. If you expect to arrive outside reception opening hours, please inform Efinor Apartments Førde in advance. From 1 October until 31 May, breakfast is only available if there are minimum 5 guests staying. If you would like to order breakfast during this period, please contact the property in advance for more information. 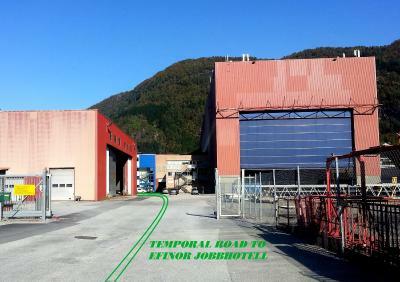 Please inform Efinor Jobbhotell Førde of your expected arrival time in advance. You can use the Special Requests box when booking, or contact the property directly using the contact details in your confirmation. The room had a spider, lots of dead mosquitoes on the writing desk, sticky spots on the floor and the shared kitchen was dirty and in poor condition (we avoided it at all cost). Access to the apartments are on a terrible road surface passing through a large industrial site. The informal parking area has lots of potholes filled with muddy water and doesn't seem to be very secure. Upon arrival processing of Visa payments were not possible, so we paid cash due to early check out the next day. We didn't receive a receipt for this payment (even though the receptionist said that she would email the receipt - which we never received). The photos on the listing is VERY misleading. 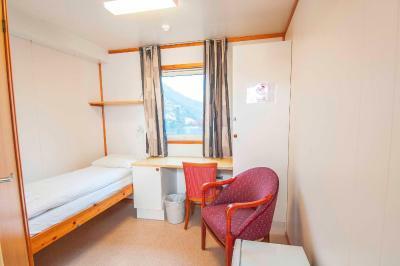 We needed a reasonable place to stay, while traveling around Norway, a clean place to sleep and even clean some clothes, before traveling on the next morning. The check in was very flexible and the young man working there was very nice, even though we arrived late. 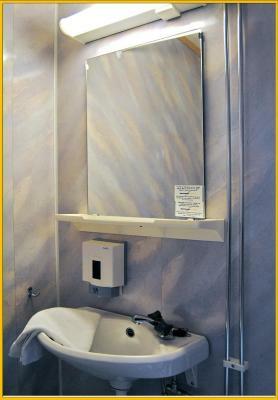 We could clean and dry our clothes (detergent was free to use), and even cook in the big kitchen, and we had a refrigerator in the room, and a private bath. After reading some of the feedback about this place, it seems many expect it to be more of a "typical" hotel. 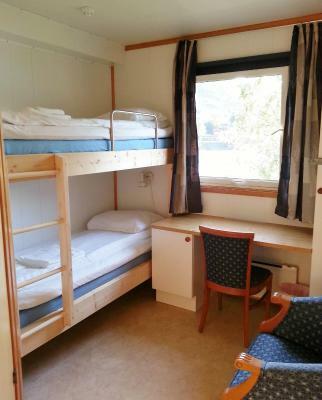 But given what a "typical" hotel in Norway costs, even those with shared bathroom, I think those critical should think about what the costs are elsewere. 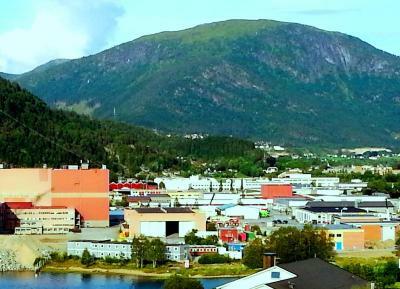 The location is in the harbour and different from your "typical" location, and the building is not pretty, but we were lucky to have a room facing the fjord, and woke up a beautiful view. We were very satisfied with everything, it's clean, flexible and practical, and if you are, like us, traveling to experience as much as possible of the country (a very expensive country!) and not to experience the hotel, I would recommend this place. I would stay again! the building is situated in a deserted industry area with mud road leading to it. the isulation in the building is not very good and you can hear all the movements in the corridor. hot water ran out when i was in the middle of shampooing. so had to finish with cold water. The building is a semi-permanent construction usually used in building side for workers. It is located within the harbor and to access it you have to pass by a dismissed construction area full of abandoned materials. The only drawback about this place is the location, out behind the industry and warehouses. Very ugly. 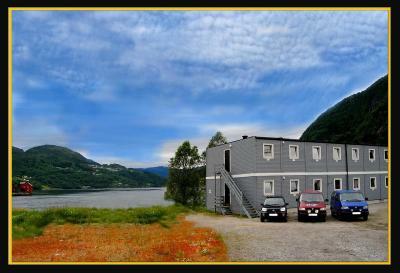 But if you can get a room on the fjord side you have a pretty view and can forget about what it looks like on the way in. Only 20 minutes walk from the center. This locatons should not be in list of lodging for tourists. You are there in the middle of an industry area. This is a good place for accomodation for workmen , not for tourists. Picture of lodging is deceivng. Room was clean, but you don't feel safe on that site. 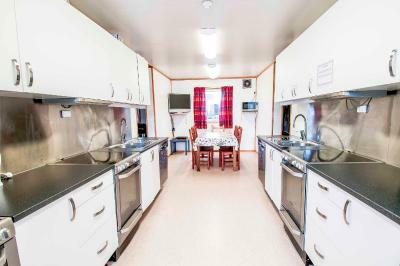 Surroundings are quite different than expected in the Booking add (see uploaded picture); perhaps temporary, as there are a lot of works around. However, it is located in an industrial area, whereas the Booking pictures suggest it is a nice country/park area. Nevertheless rooms are clean, quiet and cheap; fairly said.